Sunday Observer/Mobitel Schoolboy Cricket Contest 2015... ...Prolific Peterite batsman Lakshina Rodrigo became the first schoolboy cricketer to top the list in the Platinum category in the 37th Sunday Observer/ Mobitel Most Popular Schoolboy Cricket contest 2015 at the end of count number one which began this week. Picking the lucky winners. from left. 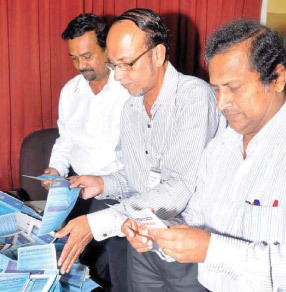 Sarath Wijetileka (Head Of Building And Maintenence ANCL) , O.M.Jayah (DGM Pre-Press and System) and Upali Peiris ( Head Of Pre-Press Operations) picking the winning coupons at the 37th Sunday Observer /Mobitel Most Popular Schoolboy Cricketer of the year contest 2015. Lakshina Rodrigo polled in 938 votes and his closest rival Charith Asalanka from Richmond College, Galle had polled 862 while Trinity’s Raveen Sayer who had a suucessful season with the ball was placed third with 608 votes. In the Gold category, Devapathiraja College, Ratgama who were newly promoted to division two and their promising cricketer Ramindu Nikeshala secured the first place with 523 votes. Rasith Upamal of Dharmaloka College, Kelaniya was places second with 251 votes. In the Silver category for division 111 schools, Siri Piyaratana MV, Padukka’s Shanaka Sampath and Mohammed Issaf of St.Aloysius College , Ratnapura were placed first and second, polling 321 and 269 votes respectively. Readers are kindly requested to write their names and addresses clearly.